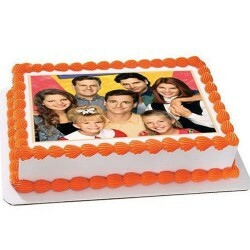 Cakes that have photo imprinted on it always come with a personal touch as these cakes are created personally If you are looking for the best type of birthday gift for your special one, gifting a birthday cake with the personal photo on it could be one of the best gestures of showing love. With the use of smart and advanced technology, a non-toxic photo can be printed perfectly and used as the topper of cakes. When it comes to celebrating the birthday or anniversary, it's really hard to find something better option than a heart touching photo cake. Gift this scrumptious cake to your sister, mother, and friend to show your deep love on their birthday, anniversary or special occasion. You can also email us the photo of your choice at orderinfo@giftjaipur.com, with your order reference no. We will use the same image on this photo cake. This is a special cake and need time for its preparation. We request you to place order for this cake at least 4 hours before you want the delivery.